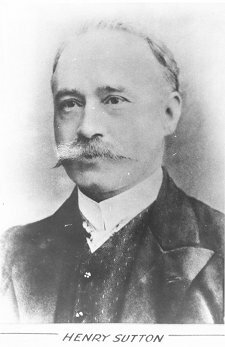 W.B Withers wrote of Sutton: "In the realm of science Ballarat has become of world-wide fame through the inventions by Mr Henry Sutton, a native of the place. His skill and acquirements in electricity, telegraphy, telephony, photography and also in astronomical and microscopal studies have won for him a high position as a practical scientist, and the credit is the greater as he is a self-taught student ... Mr Sutton, before he was fourteen years old, had read every book on science to be found in the library of the Ballarat Mechanics' Institute." The Ballarat School of Mines (SMB) was fortunate to have this genius appointed as the lecturer-in-charge of the new Electricity and Magnetism department from 23 April 1883. Although Henry Sutton submitted his resignation to the Council of SMB in October 1884 it was resolved that he be asked to reconsider, and Mr Sutton continued to teach at SMB until the end of 1886. He was a prominent member of the Camera Club, and many of the other SMB clubs. Henry Sutton spent much thought on artificial flight, and made some interesting experimental studies with flying birds. The storage of electricity also attracted his attention, and, after much work and thought evolved the Sutton Secondary Battery. A paper on this battery was presented to the Royal Society, London, and was afterwards printed in the 'Transactions'. 1867: Henry was schooled by his mother Mary till age 11, he was then left to his own devices and studied unaided. 1870: Read every book on science in the Ballarat Mechanics Institute by age 14. 1870: Designed and built an ornithopter (helicopter) driven by a clock work which could fly in a circumference of 12 feet from left to right and upwards at any desired angle. The ornithopter was fixed on a lever having a universal joint so that it could move in any direction. Henry is credited with being the first person in Australia to have experimented with flight. 1870: Conducted experiments in heavier than air materials for flight.
? : Won a silver medal for design and 30 other prizes for drawing at the Ballarat School of Design whilst a student there.
? : Designed and built a torpedo 8 ft long that could travel 10 to 25 yards under water, Henry took a patent out in New South Wales on an explosive engine. Lack of funds prevented the idea from moving forward. 1876: At age 20 Henry read a brief account of Alexander Graham Bell's telephone in 'Scientific American'. Bell's telephone patent was issued on 7 March 1876 and within 6 months Henry Sutton had designed and built at least 20 different types of telephones. Henry wired up Sutton's Music Store and the Warehouse with telephone lines. This was at least 2 years before Australia's first official telephone system was installed in Melbourne (c1878). The first telephone exchange was in 1880 shortly before Ned Kelly was hanged and by 1884 7,757 calls had been made. Henry did not patent his telephones as he believed the fruits of science should be available to all. Later 16 of his designs were patented by others less noble. 1878: At the request of F.W. Brearey, the secretary of the Aeronautical Society of Great Britain, Henry wrote 2 papers on artificial flight which were published in the Annual Report of the Aeronautical Society of Great Britain. The theory for these two papers were conceived by Henry at age 10 by observing birds and insects. 1880: Henry Sutton was working independently on Carbon Lamps (incandescent globes) without any knowledge of Thomas Edison's work on similar lines. Henry designs and builds the electric light bulb independent of Edison but due to his isolation from the rest of the world Edison beat him to it. Edison, on 21 December 1879; and Sutton on 6 January 1880 only 16 days apart. It was recorded by the Victorian Government Astronomer R.L.J. Ellery that Henry had invented the light globe at the same time as Edison but due to Henry's isolation from the world stage Edison got the credit.
? : Henry invents a method for using gas and water pipes to transmit telegraph signals.
? : Invented a colour printing process and a intaglio photo printing, a photographic process to make printing blocks. Henry was the first to use a screen to break up the image of a photograph or picture even before Miessenbach obtained the credit for it. Henry did make attempts to get his process on the London market but just previously Miessenbach had printing firms in his favour and they used his process. Henry's method then went to America and was utilised there without any advantage to himself. 1881: Designed and built a Storage Battery. His paper on this invention was published in the Proceedings of the Royal Society of London and in the Royal Society of Victoria Transactions and Proceedings in 1881. 1881: On 13 December 1881 Henry's paper on the mercury air pump was read at the Royal Society of Victoria and was published in the Societies 1882 Transactions and Proceedings. The paper was also published by 'The English Mechanic' and in the 'World of Science' on 21 July 1882. The vacuum pump created a perfect vacuum and The Swan Edison Company newly formed in England thought so much of Henry's design they used his principles for creating a vacuum in their electric light bulbs. 1883: From 1883-1887 Henry is employed as a Lecturer in applied Electricity at the Ballarat School of Mines (SMB). While lecturing at the school Henry was frustrated at the delays in obtaining scientific instruments from England. This led him to organise a production facility for scientific instruments in Australia. That facility led to the emergence of Victoria's scientific instrument industry. During Henry's time as a lecturer at the Ballarat School of Mines (SMB) he set up a telephone system around the Ballarat Mechanics Institute. It was probably the world's first academic institute to be wired up with telephones. Henry was a prominent member of the Camera Club and many other SMB clubs. While a lecturer at the Institute Henry also invented a cheap and effective method of cleansing bottles or containers in a rapid and practical manner. He also invented a mercury vacuum pump worked by water jet for use in chemistry classes. 1883: Henry becomes a member of the Royal Society of Victoria.
? : Henry becomes an associate member of the Victorian Institute of Electrical Engineers.
? : Studies in Astronomical and Microscopical, Henry had a large telescope to which he adapted a device which allowed it to be turned in any direction. 1885: Henry's invention of the Telephane was the forerunner to television 3 years before John Logie Baird was born. Around 1870 at the age of fifteen Henry invented a method so that any big event in Melbourne could be seen in Ballarat by medium of the telegraph. In 1890 Henry went to England and demonstrated the Telephane to the scientific community. Henry's paper on the Telephane was published in England, France and America and Scientific America republished his paper again in 1910. Henry did not patent the Telephane but Baird did use Henry's principles to invent television some 43 years later. The Telephane is considered to be Henry's magnum opus by some people.
? : Designed and helped build Australia's first hydraulic elevator lift with the Austral Otis Lift Company, the lift was installed in Sutton's Music Store in Ballarat which became an instant draw card and novelty with the public.
? : Made improvements to lantern lenses. 1887: Invents and patents on the 20 October 1887 an improved method of Photo-lithography to enable photographs to be printed in newspapers. 1889: Henry invents a telegraph facsimile which was a relatively simple means to transmit photographic printing plates similar to Alexander Bain's and Giovanni Caselli's systems. Henry's machine's sole difference consisted in producing another printing plate at the receiving end, rather than just a piece of paper chemically treated with potassium-iodide. 1890: Henry left Australia and travelled the world for 4 years in pursuit of knowledge and to meet other inventors and scientists such as Bell and Edison, Henry travelled to England, Europe and America. On the 3 February 1890 just before Henry left Ballarat to travel overseas the city and citizens of Ballarat presented Henry with a farewell Charter it was signed by the Mayor of Ballarat City Mr William Little and the Mayor of Ballarat Town Mr Edward Murphy. Henry left Australia for London in February 1890 on the ship fittingly called " Ballarat." 1890: Henry's paper on the Telephane published in the French science Journal La Lumiere Electrique and in 1890 Henry demonstrated his Telephane system to the Royal Society of London. He then went onto France and demonstrated it there.
? : Room is named after Henry Sutton at the Ballarat Mechanics Institute it is called The Sutton Room. 1897: Began Designing and building Combustion Engines and carburettors, he under went many experiments on air cooled engines to run on low grade fuel. Henry applied for a patent titled "improvements in and relating to internal combustion engines" in 1898. 1897: Henry took out a number of patents relating to bicycles he also designed and built a motorised two cylinder three wheeler tricycle for pacing racing motorcycles. The motorised tricycle which could travel a long distance travelled from Melbourne to Ballarat in September 1897 and created public hysteria and interest when it arrived. Police had to control the crowd to prevent a riot. Henry, along with his son Arthur, went on to design and build a number of motorcycles. 1899: Designed and built one of Australia's first cars in Melbourne. It was called The Sutton Autocar, an Antipodean invention which could go 30 kilometres an hour. This car may have been the first front wheel drive car in the world. Henry's car was reported in the English press at the time and featured in the English magazine Autocar which the car was named after. Two prototypes of the Autocar were built and the Austral Otis Company was going to go into business with Henry to manufacture Henry's car but the cost of the car was too preventative as it could not compete with the cost of imported cars. 1899: Henry was invited by M. Clocheary a member of the French Government to become a member of the Societe Internationale in France. 1900: Henry designs and builds another car in Ballarat which has been fully restored and is privately owned. In 2009 it was on display at the White House Museum in Westbury Tasmania. 1901: Henry participates in the Dunlop Melbourne to Warrnambool Reliability Race with one of his cars. 1903: Henry was a co-founder of the Royal Automobile Club of Victoria. At a meeting at the Port Phillip Club on the 9 December 1903, 55 motorists which included car owners and motorcyclists agreed to form the Automobile Club of Victoria now known as the Royal Auto mobile Club of Victoria. Henry at the meeting wrote the motion at the meeting and it was voted on and so the club was born. Henry who was part of the provisional committee drew up the drew up the constitution the constitution and rules were approved by about 70 members at 2 meetings in January 1904 .The Automobile Club of Victoria gained royal charter in 1916. Henry served on the council of the RACV from 1903-1908, in 1903 there were 55 founding members and in 2009 there are over 1.9 million members. 1906 On 12 July The Marconi Wireless Telegraph Company's representative Captain Louis Walker exchanged messages across Bass Strait between Point Lonsdale Victoria and Devonport Tasmania. The 12 July 1906 was a sitting day in Melbourne For the House of Representatives of the Australian Parliament. At the invitation of Captain Walker The Australian Prime Minister Alfred Deakin, The Governor General Henry Stafford, The Governor of Victoria Sir Reginald Talbot, most of the members and the ministry attended the wireless demonstration by Walker. Henry Sutton and many other guests also attended this demonstration of Marconi's Wireless System and a special train was organised to take all the guests to Queenscliff. As the Australian Government announced in May 1905 that it was considering a wireless telegraphy system for Australia after the demonstration the Australian Government decided to build an Australian Wireless system around Australia. This eventually lead to Henry Sutton working with the Australian Naval Director William Rooke Creswell. Between 1906 and 1912 Henry worked on inventing a wireless system for the Australian Government and the new Australian Navy. During this time Henry invents and perfects The Sutton System of Australian Wireless, noted in the Melbourne Age Newspaper on the 30 July 1912 upon Henry's death to be his greatest invention. 1904 and 1906. Henry's son Arthur raced motorcycles at these races, in 1906 Arthur Sutton won the first VMCC 100 mile motorcycle race. 1909: Post Master General of Victoria, Sir John Quick, grants Henry Sutton an Experimental Radio License. Sutton receives license number 2, which was issued on 7 October 1909. It was capable of a 250 mile range. 1910: Alexander Graham Bell and Frederick Walker (Casey) Baldwin who travelled with Bell on his world tour visits Henry Sutton in Australia and travels to Ballarat in July/August 1910 to view his telephone system and many inventions. Bell was truly astonished by Henry's achievements.
? : Henry builds the worlds first Portable Wireless with a range of 500 yards (457m). 2004: On the 20 January 2004 a street in the Canberra suburb of Dunlop is named in Henry Sutton's honour, the street is called Henry Sutton Circuit. 2009: Australia's history refers to Henry Sutton as the great grandfather of technology and was Australia's Edison yet he has become Australia's forgotten genius despite the fact that he was well known and respected all over the world for his contributions to science and his many inventions. Henry's isolation from the rest of the world and his refusal to patent most of his inventions has left him virtually unknown today but to the many who know about him he is admired and applauded for his achievements and contributions to science and to Australia's inventing history. Henry's pioneering work stands alone even today, he just was not the one that got the credit for his work but on looking back no one can argue the credit he should have been given and the importance of his pioneering work both here in Australia and on the world stage. This biography was researched by Clare Gervasoni, November 2005; updated in May 2009 with thanks to Lorayne Branch. 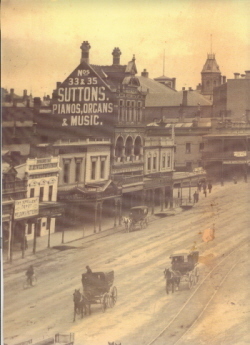 Image caption (left): Sutton's Music Store, Sturt Street Ballarat. Henry Sutton installed a telephone system into the family music store and at SMB. Both were most probably viewed by Alexander G. Bell when he visited Henry Sutton at Ballarat.